When you think about your average ‘Old McDonald’-type farm, these are the animals that instantly spring to mind. Unless, of course, you happen to be a fan of an equally loved but less considered creature- the agile, head-butting goat! 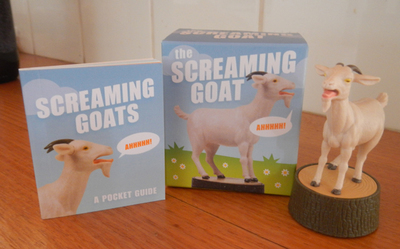 Brisbane-based Soraya Hirth and her family live with several goats, and this little book features a collection of photographs that she has taken of them. You are likely to find these photographs already on her Instagram account- @itsagoatlife- as she posts them up every day, but if you’re after a hardcopy version of them, then this should fit the bill. With cute images and themed captions, this book is a lot like many of the puppy and kitten gift books that you usually find (although obviously the focus here is on goats and kids, rather than felines and canines). The antics of the goats in some of the images are sure to raise a chuckle or two, and if not that, then definitely a smile. It’s amazing how one small event can create a domino effect that ultimately changes your life forever. This is what happened when a former New York career girl fell in love with a couple of baby goats. After relocating to New Jersey with her husband, Leanne Lauricella’s little family grew, as they decided to take on the two male goats mentioned above, who would have been destined for slaughter. Not long after this, three more baby goats joined the family. 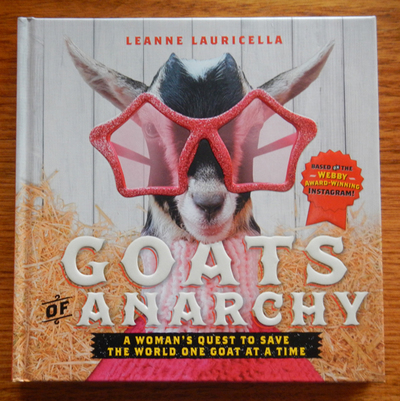 Before long, Leanne was leaving her event-planning career and raising her goats full time. She started adopting special needs goats, and goats that had been abused- essentially starting her own little rescue sanctuary. Posting photos on her Instagram account- @goatsofanarchy- she was able to reach thousands of followers and create a strong support base for her rescue farm. 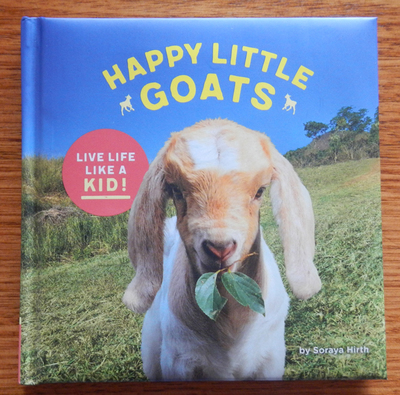 Now she has released this book, giving a background on all of her little friends, which include 25 goats, 2 pigs, a miniature horse and a miniature donkey. There are plenty of cute and entertaining pictures of the animals, as they play, cuddle and pose in costumes, and it’s obvious through their stories that the bond between Leanne and her animals is strong, despite some of the residual wariness of the previously-abused animals. 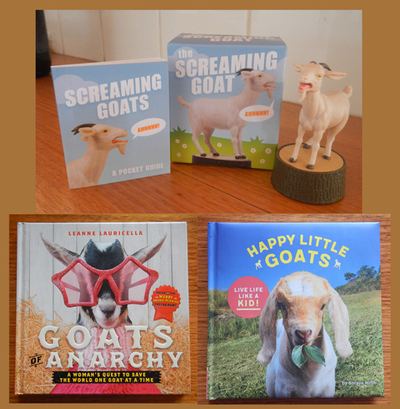 This would make the perfect gift for fans of the @goatsofanarchy Instagram account, people that have a deep respect for the work that Leanne Lauricella does, or even just for fans of cute goat photos. Nice one! I have a soft spot for goats. I got to pat one recently and he was lovely.